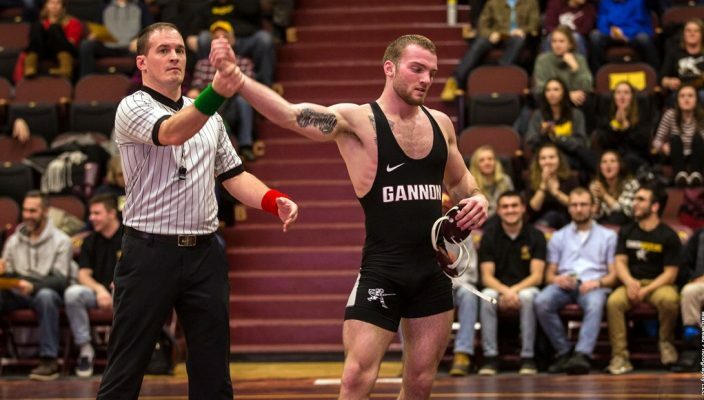 After upsetting the nation’s seventh-ranked team in the University of Pittsburgh-Johnstown on Jan. 23, the Gannon University men’s wrestling team suffered a rough loss to Kutztown University Saturday in Pennsylvania State Athletic Conference action. In addition to the dual meets, the Knights’ “B” team also competed Sunday in the Jamestown Jayhawk Open where freshman Alex Farenchak took gold in the 157-pound bracket. In the 18-17 loss to 16th-ranked Kutztown Saturday at the Hammermill Center, Gannon won the first four bouts to take a 14-3 lead, but the visitors rebounded to claim four of the final five matches and win the meet. Gannon dropped the 125-pound contest as Kutztown’s Matt Wilde beat the Knights’ Jacob Dunlop – ranked No. 11 nationally – in a 6-3 decision. But the Knights rallied to take the next four matches, as Nick Young (141) and Evan Fisler (157) came away with major decisions and Austin Hertel (133) and Dom Means (149) each posted decisions. However, Kutztown would go on to win at 165, 174, 184 and 285 pounds to claim its 11th straight dual-meet win. Only Freddie Nixon at 197 was able to win for Gannon in the last five matches. The Knights also were penalized a point for unsportsmanlike conduct following the 184-pound match. Gannon pulled off a significant triumph on Jan. 23, as the Knights ended Pitt-Johnstown’s 24-match PSAC winning streak, 22-15. Means (149) and Connor Day (165) recorded falls, and Hertel won a major decision victory at 133 pounds. Day has now recorded seven pins this year while Means has two. Other Gannon winners were Fisler at 157 and Anthony Williamson at 184. Both teams won five bouts, but the Knights picked up seven bonus points while Pitt-Johnstown didn’t score any. UPJ prevailed at 125, 141, 174, 197 and 285 pounds with UPJ’s Brendan Howard, Joey Alessandro, Brock Biddle, Levi Neibauer and Tyler Oliver claiming victories over Dunlop, Young, Joel Leise, Nixon and Keith Swartley, respectively. The Jan. 23 victory over UPJ was Gannon’s first since win over the Mountain Cats since Jan. 13, 2011. At the Jayhawk Open, seven Gannon wrestlers finished among the top five in their respective weight classes, led by Farenchak, who took first with a 4-0 record. He pinned Penn State Fayette’s Tyler Steele in 6:11, defeated teammate Luke Walter and captured the 157-pound division with a 6-3 decision over Alfred’s Mike Galton. Jud Ramage placed second in the 197-pound class with a 3-1 record. At 165, Giovanni Ciotti went 4-1 to finish third while Luigi Yates (184) also placed third after going 4-1. The Knights’ next match will be at Millersville University at 7 p.m. Friday, and they’ll also battle Shippensburg at 1 p.m. Saturday on the road. Gannon’s “B” team will be in action at the Edinboro Open and at Jamestown Community College, both on Saturday.